Welcome to my Amateur "Ham" Radio site. If you're looking for more general information about who N8ZAK is, you can check out my personal website at www.ZackBurns.com, but I primarily use this site you're on now to detail my foray into Amateur Radio. You can navigate this site using the navigation links across the top of the site or by browsing the site map to dig around a bit. If you have want to chat, look me up online (or on the airwaves!). When I'm in the shack or mobile, I monitor 145.670 Simplex (FM/DV), the TMRA 147.270 FM repeater, the TMRA D-Star 442.750 repeater, the TMRA 442.850 Fusion repeater, and of course my own Fusion repeater (W8ODR) on 444.5125 Mhz. I am also Trustee of the Ohio Digital Radio Club a club designed to educate and promote the usage of digital communications with the respect to Amateur Radio. All hams are welcome to apply to this club. I was a 1970's baby and on summer family trips out to Missouri to see my grandparents my Dad would fire up the CB radio (whether is was the Yellow Chevrolet Chevette or Dodge Aries Station Wagon) mostly to keep abreast of the traffic conditions and to call for help (you'd understand if you ever had either one of those vehicles!). In the late 1980's I was running a BBS (dialup Bulletin Board Software on my Tandy 1000 and a 16Mhz 386 Clone) and trading freeware/shareware files on a public net. I'd always run across 2m Safety Bands as part of the freeware/shareware file scene. So that peaked my interest in exploring more about scanning public safety. I used to frequent the local Radio Shack and ran across a crystal-based base station scanner. So I bought it (not knowing what I was getting into and what frequencies were covered) and found most of the analog police/fire/rescue frequencies were covered. I'd fall asleep every night listening to that. One Christmas I asked Santa Claus for a new scanner. "He" brought me a Uniden Bearcat BC200-XLT (with Cell Frequencies). This was AWESOME and I still have it. Anyway, the great thing about this was it was mobile, and I could program the frequencies in it - no more crystals to deal with. Several years passed...I'd frequently purchase the Gordon West Ham Radio books, and just find myself bored by reading them and always was afraid of learning CW (Morse Code). In the late 1990's I even picked up a No-Code Novice book, but still didn't like reading his books - sorry Gordon! I think the books were just too general - I like knowing the "why" and digging down to the nitty-gritty. But I understand his materials are just to get somebody up and running. Again several more years passed, and in 2008 I purchased a couple of FRS (Family Radio Service) which transmit/receive in the 400Mhz spectrum and doesn't required licensing (if you stay within the rules), but you're limited to a few channels legally. Being a good citizen, went to register mine with the FCC (Federal Communications Commission) so I could use the entire 22 channel spectrum and up to 50 watts of power (even though most of the portables you buy are less than 5 watts) that will get you up to 20 miles - given ideal conditions, but most likely you're lucky to get 5 miles tops. On the FCC site I dug around and noticed Amateur Licensing registration and then that got me to the ARRL (American Radio Relay League) which published testing locations and dates for upcoming license exams. So in late 2008, I studied the ARRL technician exam books, and with the help of the TMRA (Toledo Mobile Radio Association), I took my test and passed. Now, I did things a little backwards and instead of getting a full-blown rig, I like to be more mobile and again thanks to Santa Claus I got my first HT mobile radio for Christmas in 2008 and that got me on the air waves. Want to get into Amateur Radio? If you're in the Toledo area, the Toledo Mobile Radio Association (or any local group) will be more than happy to help you study and get your license. See you on the air! 02/12/16 - I haven't bought a new piece of ham equipment in almost 2 years. So figured it's time. 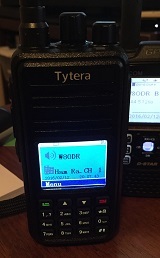 Starting to get into MotoTrbo/DMR and couldn't pass up the Tytera MD-380 for $125.00. 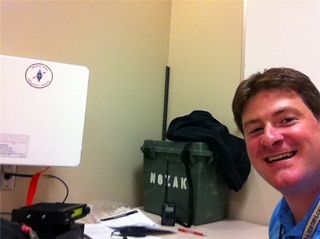 My ID on the DMR network is 3139376 and 3139377 you can find me on the N8EFJ 444.850 DMR repeater in Toledo. 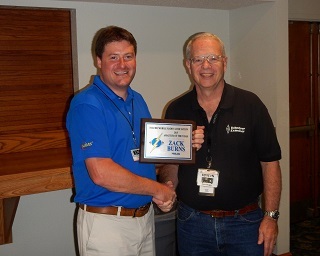 I was awarded TMRA's 2015 Ham of the Year Award. Receiving this award was totally unexpected. I only have the entire membership and excellent elmers to thank for receiving this award. The wisdom and friendship these members and fellow hams have bestowed upon me will last a lifetime. Thank you! I enjoy helping others, and here I am manning the radio at the Toledo Hospital for a SET (Simulated Emergency Test) scenario. Interested in helping out? Check out your local ARES (Amatuer Radio Emergency Service) group.